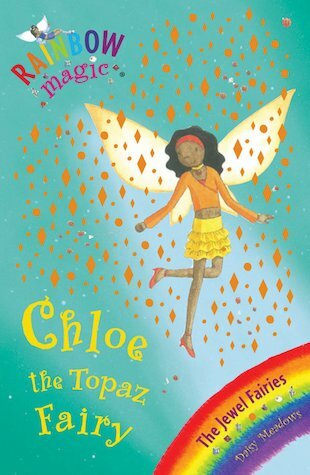 Chloe is the topaz fairy. topaz are rare jewels and i think this book is the best of the jewel faires! I really do love this book espicially when the goblins pretend to be manequins, Really Good! Chloe the Topaz Fairy looks after the magic of transformation. But how can she turn girls into fairies and goblins into teddy bears without her magic gemstone????? Kirsty and Rachel go into a costume shop when they thought they saw two goblins stading in a display window. When everything goes kooky and lights change into disco balls, it is time to find the gem! Can they find it before the store worker sees Chloe?